Valentine's Day is coming up, and while I'm not inspired by anything pink or red or covered in hearts, I do like to make a quality, real food special treat that husband and I can enjoy. I've made homemade chocolate almond butter cups before (they were amaaaaazing), but I really wanted to master the homemade chocolate part as well, rather than melting super-sweet, store-bought chocolate chips. I didn't trust that this would be possible, because when I've made chocolate bark-type goodies before with coconut oil, they only work frozen or refrigerated because coconut oil melts so low. But, I remembered seeing a recipe in The 21-Day Sugar Detox book for homemade chocolate almond butter cups--turns out a similar method but sweetened is on Balanced Bites, here and in Practical Paleo--and it uses the basics (cocoa powder and coconut oil) but also coconut butter/pureed coconut concentrate. When I figured out how to make homemade coconut butter (the trick: process it until you think it's done, then process it some more), I absolutely loved it, but I'd forgotten how versatile it is for coconut-ey desserts like this! And, mixing it in to the chocolate mixture is genius because coconut butter is solid at room temperature! So when I decided to try making my own, I wanted to come up with a filling other than almond butter or nut butter to do something different... and I figured, why improve on the genius-ness of the coconut butter?? So I did a coconut butter, honey-sweetened filling! Simple, no extra flavors, a great baseline for fancier goodies later on if I decide to get creative. Combine all the chocolate ingredients except the vanilla in a small saucepan or double boiler. Heat and stir constantly until just melted. Turn off heat and add vanilla. Spoon half of the chocolate mixture into candy molds, filling each just less than 1/3 full (for my larger molds, this was about 1 teaspoon, although I didn't do them all evenly!). (For smaller molds, you can also use a ziploc bag with the end cut off to squeeze the melted mixtures into place.) Put in fridge or freezer to harden. Combine all the coconut filling ingredients except the vanilla in a small saucepan or double boiler. Heat and stir constantly until just melted. Turn off heat and add vanilla. Once bottom layer of chocolates is solid, spoon coconut mixture on top. (Again, for me this was about 1 teaspoon in large molds.) Put in fridge or freezer to harden. Once coconut layer is solid, spoon more chocolate on top. Put in fridge or freezer to harden. Pop chocolates out of molds. Optional: brush a couple drops water on tops and sprinkle with unsweetened dried shredded (or flaked) coconut. Serve room temperature for excellent texture/smoothness and still very strong structure, thanks to the coconut butter! Try different shaped molds, too! I think both of the molds I used are too big! So I've been cutting these in half. Mint extract added to the chocolate part! Or coconut creamy center, I guess. The best part is, too, when you make a treat yourself you know exactly what went into it. No feeling icky afterwards and not knowing exactly what did it. And, the extra effort of making something before you enjoy it makes it taste even better!! wowza! these look awesome! :) love your photos too! These look fancy enough to be in a chocolate boutique! Oh my gosh. Those look so good. Can't believe those are paleo! Love it! My roommate is currently following a paleo diet! I can't wait to share these with her. She will LOVE them. Thanks! My husband would love these. Two of his favorite things together! Thank you for this! My husband and I decided to try the Paleo Diet beginning in January, and I love how I feel so I want to keep it up. 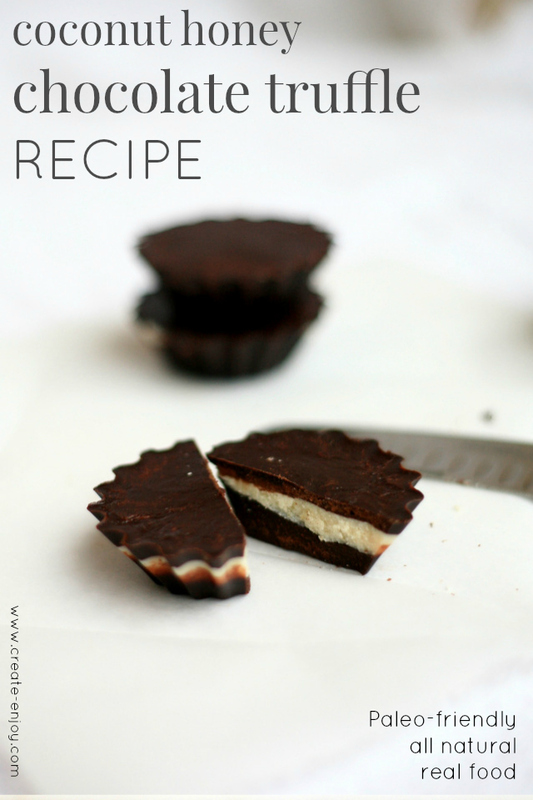 But I have been having this craving for chocolate the past few days so this recipe looks like the perfect fix! I have a question for you, though. How long does it take for the chocolate to harden? How long would you say it takes to make a batch? Thanks again! Pinning and can't wait to try these! Those look good! I'm still pretty hooked on sugar, but these look like a good substitution. Excellent, congrats!! It does feel great! I think the chocolate hardened in the fridge in 20 or 30 minutes. I think. Freezer would be even faster! 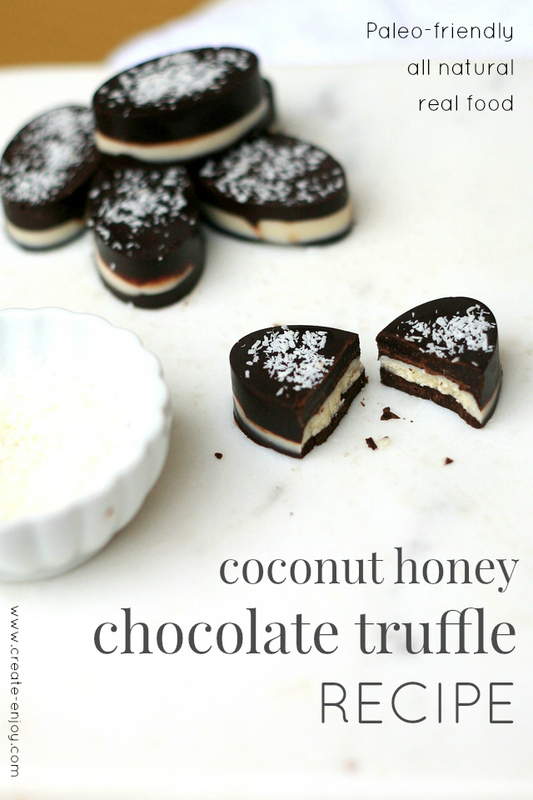 Oh my, chocolate and coconut! It doesn't get any better.